In shaping the course of civilization, mining plays a unique, important role in the world economy and the future of society by filling the persistent demands for raw earthen materials and native metals. Mineral needs are present in all societies and mining contributes essential products for their sustained economic future. Metals and industrial minerals are used in every sector of construction and manufacturing. Energy minerals provide electricity and fuels for all aspects of industry and society. Agriculture depends on minerals for fertilizers and pesticides. Indeed, mining is at the foundation of civilization, no matter how primitive or advanced. 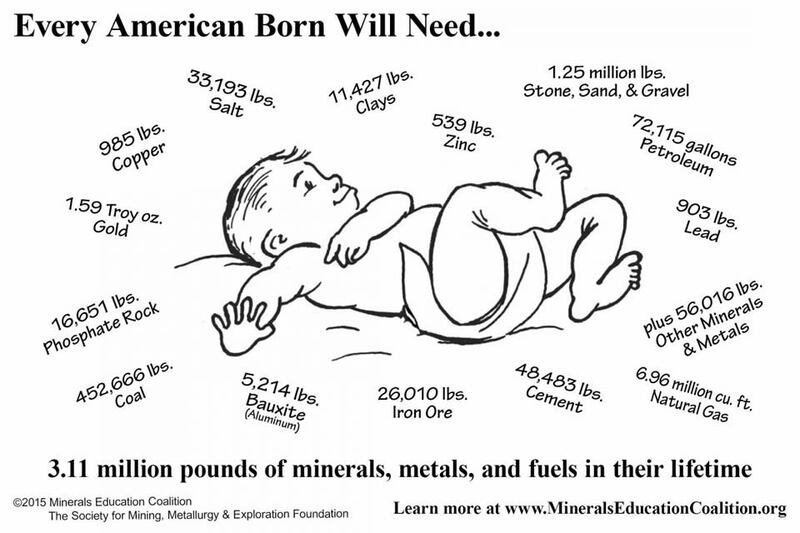 Every American baby will require approximately 3 million pounds of minerals in their lifetime (Fig. 1) and every year more than 38,000 pounds of minerals must be mined to meet the needs of each American (Fig. 2). FIGURE 1. Every American baby will require approximately 3 million pounds of minerals in their lifetime (from Mineral Information Institute,http://www.mineralseducationcoalition.org/sites/default/files/uploads/2015baby.jpg, accessed 8/29/2016). FIGURE 2. Every year more than 38,000 pounds of minerals must be mined to meet the needs of each American (http://www.mineralseducationcoalition.org/pdfs/baby_info.pdf, accessed 12/5/13). The production and flow of minerals in the United States and the world has increased dramatically in the last century in order to meet the demands of our technological lifestyle (Fig. 3; Wagner, 2002). The U.S. is a major producer of aggregate, iron, copper, lead, zinc, gold, silver, molybdenum and industrial minerals and it also imports these and other commodities (Wagner, 2002). Production and consumption of minerals will increase in the future as population increases worldwide and as people demand an increasingly better quality of life. FIGURE 2. U. S. flow of raw materials by weight 1900-2014. The use of raw materials in the U. S. increased dramatically during the last 100 years (modified from Wagner, 2002). The value of mining multiplies in the economy in a number of ways. Mining provides benefits to the communities where they are located by contributing wages, economic activity due to purchases of goods and services, taxes, royalties and fees to local, state and national governments. Mine staffs are highly trained and educated, and their wages average higher than other industrial and social sectors. Mining operations bring training and experience to communities that reach beyond mining. For instance, many of the first responders and emergency medical technicians in rural areas are trained and employed by the mining industry. Environmentally responsible mining and mineral processing is important to national economies and to quality of life as indicated by the following quote from the International Institute for Environment and Development: “One of the greatest challenges facing the world today is integrating economic activity with environmental integrity and social concern. The fulfillment of ‘needs’ is central to the definition of sustainable development” (IIED, 2002). A large part of the contribution of mining to sustainable development is the continuing flow of minerals by mining while protecting the well being of the physical and social environment as possible (McLemore and Turner, 2004). New Mexico's mineral wealth is one of the richest endowments of any state in the U.S. (McLemore et al., 2002; U.S. Geological Survey, 2013; Krisanda, 2013). In 2016, New Mexico ranked 20th in the U.S. in nonfuel minerals production (Table 1). New Mexico also ranked 12th in coal production in the U.S. In addition, significant reserves of coal, copper, potash, and molybdenum are identified in the state. Most of New Mexico’s mineral production comes from coal, copper, and potash. Other commodities produced in the state include a variety of industrial minerals (including stone and aggregate), sulfuric acid, molybdenum, gold, uranium, and silver. Selected uses of some of these commodities is in Table 2. TABLE 1. Total minerals production value in New Mexico from 1989 to 2011. TABLE 2. Selected uses of commodities found in New Mexico. A healthy energy and mineral industry is vitally important to the economy of New Mexico and to maintenance of public education and services. The minerals industries provide property and corporate income taxes, while their ~35,000 direct employees contributed millions of dollars of personal income taxes (New Mexico Energy and Minerals Division, 2015). The number of mines and actual tonnage of produced minerals has declined in recent years (McLemore, 2017). This decline is a result of numerous complex and interrelated factors. Some of the more important factors include declining profits in mineral operations, decreased quality of ore (for example, lower grades and more difficult ore to process), competition from the global market, and a shift from coal-generated electricity to alternative energy sources. New mines face a multitude of challenges, including water availability, water rights issues, public perceptions, a complex regulatory process and public opposition to mineral exploration and mining. IIED (International Institute for Environment and Development), 2002, Mining Minerals Sustainable Development Breaking new ground: International Institute for Environment and Development, http://www.iied.org/mining-minerals-sustainable-development-10-years-mmsd-10, accessed 12/5/13. McLemore, V.T., 2017, Mining Districts and Prospect Areas in New Mexico: New Mexico Bureau of Geology and Mineral Resources, Resource Map 24, 65 p.